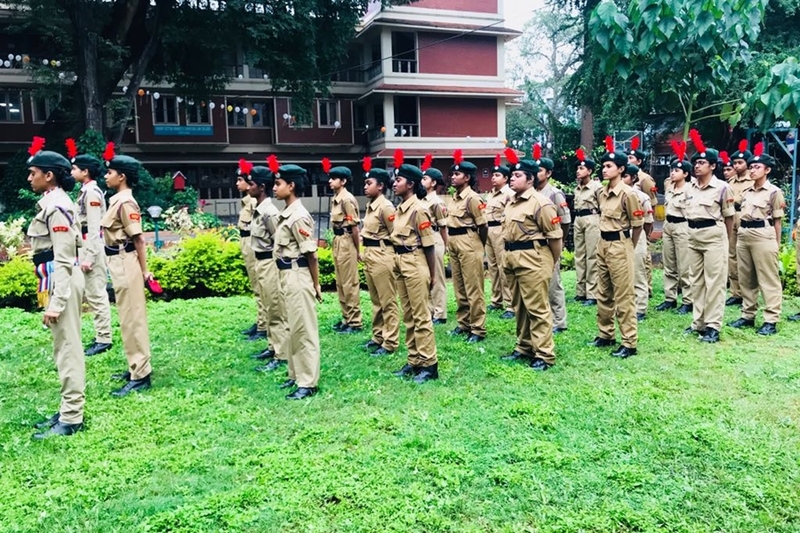 The Enrollment of students for the year 2014-15, began on the 16th July with a programme on the overview of NCC by 1 Karnataka Girls Battalion. The GCI and one PI staff were present for the programme and GCI highlighted the benefits of NCC and its importance in life. Students were selected on their basis of their physical fitness through a number of races such as shuttle and sit ups.30 girls were selected and became a part of the NCC unit for the year 2013-2014 and attended a number of camps. 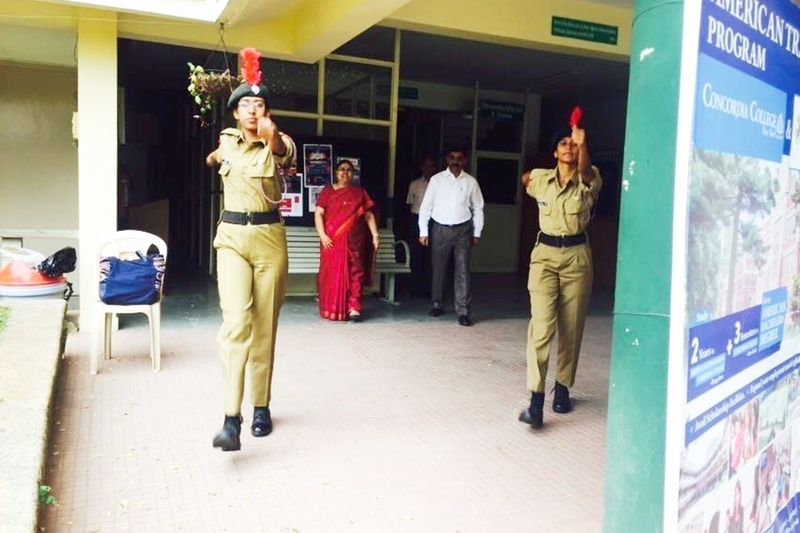 Independence Day – on 15th August 2014 along with the NCC cadets,the NSS Students,Union members and the students of BCWcc celebrated Independence day.Dr.Esther Malini, The principal-in-Charge of the PUC section of the college addressed the gathering. Hospital Attachment Training Camp (HATC) – This Camp was held from 13th October 2014 to 24th October at Command Hospital for Ten days.Cadet SGT.Simran Mondal participated from our college. Combined Annual Training Camp (CATC) was compulsory for all the cadets.19 Cadets attended the camp.The camp was held from 19th oct’2014 – 28th oct’2014 at Doddaballapura Besant Park. National Integration Camp (NIC) – Held on 18th Dec’2014 – 29th Dec’2014 at Madikeri . cadet Lochan B.U. (JUO) and Bhuvana (SGT) attended this camp. Trekking and Map Reading – Held on 10th Jan’2015 . All NCC Cadets undertook a trek to Nandi Hills with PI Staff from 1 Kar Girls BN NCC. NCC Day – The NCC day is celebrated on the 4th Sunday of november . However , in the college NCC cadets celebrated NCC Day on 28th November 2014. Social service and community Development Activity – On 16th January 2015,programme on Swachh Bharath Abhiyaan, Rural Sanitation and Health and Hygiene under Social service and community Development Activity were conducted by the NCCANO and the NCC Cadets of BCWCC. Republic Day – On 26th January 2014 along with the NCC Cadets , the NSS students Union members and the students of BCWCC celebrated Republic day.The principal Prof.Esther prasanakumar addressed the gathering. All the 20 parades were conducted successfully for the Academic year 2013- 2014.
c. Singing – 2nd place JUO . Lochan B.U., and SGT. Shubhashree, LCPL.Lakshmi B.J.,LCPL. Rebecca and cadet Ramya. d. Individual Quiz – 2nd place SGT . Bhuvana represented Karnataka ‘A’ group. The regular activities of the NCC unit began with NCC Enrollment of students for the year 2015-2016, on the 16th July 2015. There was a good response from both PUC and Degree students in their physical fitness through a number of races and shuttle. The GCI along with a PI staff from 1 Karnataka Girls Battalion was present for the Enrollment and the GCI highlighted the benefits of NCC. 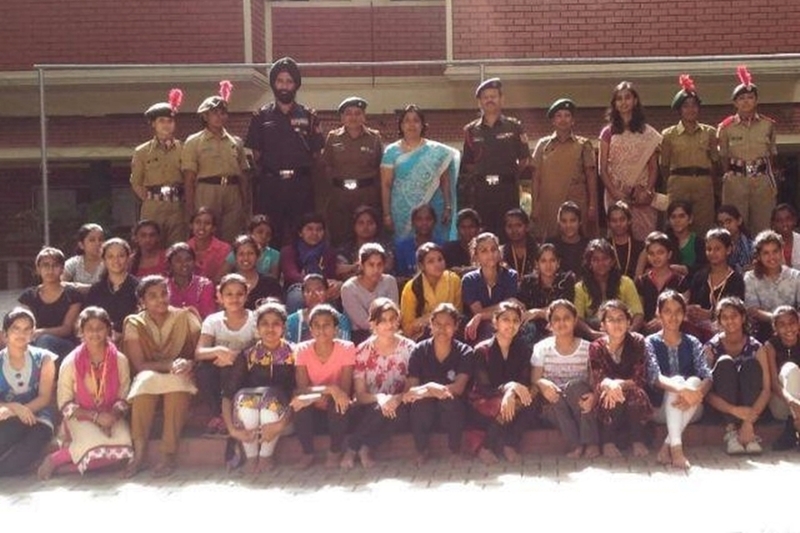 40 girls were selected and became a part of the NCC Unit for the year 2015-2016, and attended a number of camps. Combined Annual Training Camp (CATC) was compulsory for all the cadets. 20 Cadets attended this Camp. The Camp was held from 29th July 2015 to 07th August 2015 at Doddaballapura Besant Park. 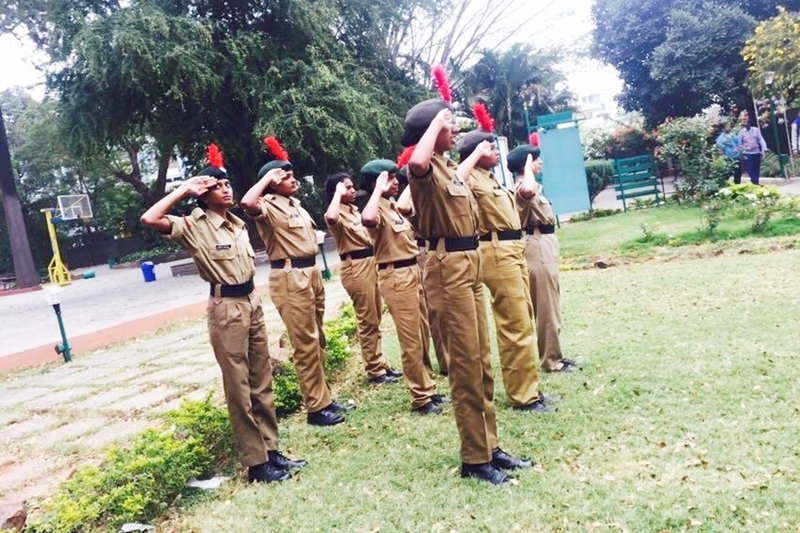 Independence Day- on 15th August 2015 was celebrated with the NCC Cadets, the NSS Students, Union Members and the students of BCWCC. Local Independence Day- was held on 15th August 2015-2016 at Manekshaw Parade Ground. JUO. Lakshmi B.J., Cadet. Madhuri M and Swathi K participated in this parade. PARA-BASIC-COURSEwas held from 2nd September 2015 to 24th September 2015 at Agra. Cadet Lakshmi B.J. (JUO) attended this course. National Integration Camp (NIC) – Held from 26th October 2015 to 10th November 2015 at Odisha. Cadet Jasmine Jennifer J. (CPL) attended this camp. NCC Day- The NCC Day is celebrated on the 4th Sunday of the month of November. Samaranjali- On December 16th, Glass House, Raj Bhavan Road, a programme Samaranjali was held in memory of martyrs, who laid down their lives for the country. 10 cadets attended this programme. Republic Day- on 26th January 2016 along with the NCC Cadets, the NSS students Union Members and the students of BCWCC celebrated Republic Day. The Principal-in-charge- Dr. Esther Malini addressed the gathering. And also the students performed dance, singing, PPT presentation and talk on freedom fighters. Local Republic Day Parade- was held on 26th January 2016 at Manekshaw Parade Ground. JUO. Lakshmi B.J., Cdt. Madhuri M, and Swathi K participated in this parade. Cadet Lakshmi B.J. (JUO) and Cadet Rebecca A. (SGT) secured the Best Cadet Award for the year 2015-2016. 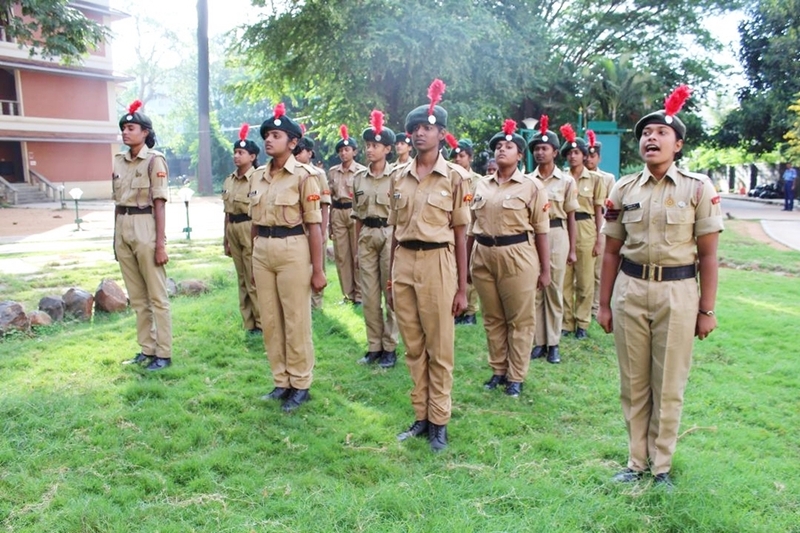 The regular activities of the NCC unit began with NCC Enrollment of students for the year 2016-2017, on the 25th July 2016.There was a good response from both PUC and Degree students in their physical fitness through a number of races and shuttle.The GCI along with a PI staff from 1 Karnataka Girls Battalion were present for the Enrollment and the GCI highlighted the benefits of NCC.40 girls were selected and became a part of the NCC Unit for the year 2016-2017, and attended a number of camps. Local Independence Day- was held on 15th August 2016 at Manekshaw Parade Ground. JUO. Swathi K had participated in this parade. Combined Annual Training Camp (CATC) was compulsory for all the cadets. 7 Cadets attended this Camp. The Camp was held from 10th October2016 to 19th October 2016 at Doddaballapura Besant Park. National Integration Camp (NIC) – Held on 14th October 2016 to 25th October 2015 at Madikeri. Cadets Preethi.R and Adalin Jancy attended this camp. VISAKA – The NCC cadets were educated on new digital mode of payments and were asked to submit their Aadhar card no. and Bank details as asked by the Unit on 16th January 2017. Republic Day- on 26th January 2017 along with the NCC Cadets, the NSS students Union Members and the students of BCWCC celebrated Republic Day. PINKATHON – (Marathon ) on 29th January 2017 , 29 NCC Cadets along with the ANO and other staff participated in support of Breast cancer awareness. Local Republic Day Parade- was held on 26th January 2016 at Manekshaw Parade Ground. Swathi K participated in this parade. The regular activities of the NCC unit began with NCC Enrollment of students for the year 2017-2018, on the 27th July 2017. 47 girls were selected and became a part of the NCC Unit for the year 2017-2018, and attended a number of camps. Combined Annual Training Camp (CATC), 10 Cadets along with the ANO attended this Camp. The Camp was held from 2nd June 2017 to 13th June 2017 at SJP College. On 15th August 2017 Independence Day was celebrated with the NCC Cadets, the NSS Students, Union Members and the students of BCWCC. OTA Gwalior Camp - SUO Swathi. S attended the OTA camp which was held from 12th May 2017 to 24th May 2017. Combined Annual Training Camp (CATC), 9 Cadets attended this Camp. The Camp was held from 3rd October 2017 to 12th October 2017 at Gnanadeep campus. DG Visit - Our College cadets attended DG visit meeting in Christ College on 15th September 2017. Para Basic course was attended by SOU Swathi.S conducted in Agra from 1st November 2017 to 24th November 2107. Republic Day - on 26th January 2018 along with the NCC Cadets, the NSS students Union Members and the students of BCWCC celebrated Republic Day. DDG Commendation was attended by SOU Swathi. S on 4th February at NMKRV College.